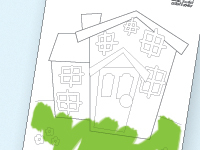 Download and print the Red House Nursery Colouring sheet. Colour it with crayons, pencil, chalks or paint to create your own masterpiece. This entry was posted on Thursday, September 4th, 2008 at 10:58 am	and is filed under Desk Activity. You can follow any responses to this entry through the RSS 2.0 feed. You can leave a response, or trackback from your own site.